Three reasons why "local" still carries value, and should remain at the top of the buzzword marketing charts. 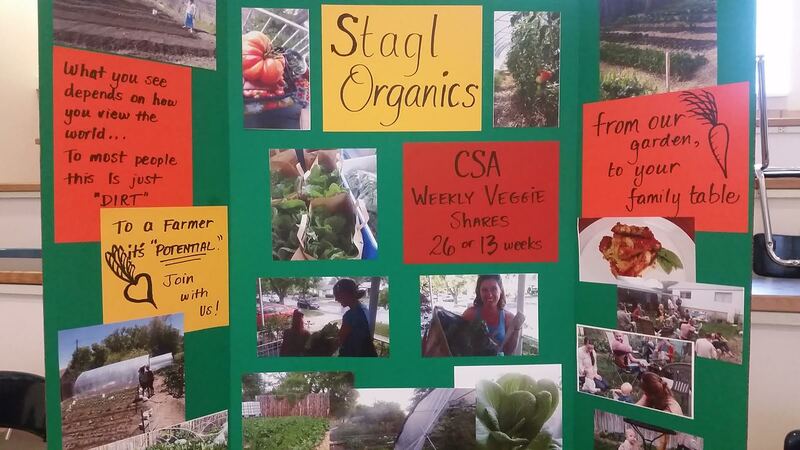 A handmade/written poster created to promote a local CSA (Community Supported Agriculture) at a Open House in the Spring of 2017. Doesn't get much organic than this! Along with many other overused, niche marketing terms such as “transparency” or “pzev”, the word “local” with its many add on’s (go local, support local, how local, local first…) has remained as one of the most commonly seen buzzwords. From highway billboards, social media platforms, food labels, and farm-to-table restaurant menus, the term has become an eye-roller. Let’s take a minute to explore three reasons why “local” still carries value and needs to be both evangelized and supported, and why for lack of a better term, should remain on the top of the buzzword-abuse marketing charts. Members of the local communities want to be sustainable, ensuring a better return or re-circulation of their revenue. The Local First Utah site reports that 55.3% of the money earned by Independent Retailers is recirculated into the local economy vs. 13.6% of the revenue brought in from National Chains. What do these percentages mean to a local economy? When we don’t support local retailers, it means that we need to gather more from outside of our community, and in essence become dependent on outside sources. For those who have concerns about the environment, energy conservation and sustainability, this dependency goes against common sense. 2. Members of communities support local businesses because they want to ensure safe standards. In short, local consumers are kicking back and want to give back. They don’t want triple-plastic wrapped, radiated produce that has traveled overseas and back to land on their dinner plates. A featured NPR story, “Chinese Chicken Is Headed To America, But It’s Really All About The Beef,” exposes some of the confusing mess around poultry that is being raised with questionable, potentially harmful standards in China, and is then being prepared, served and consumed by hungry American households. Local goods and services are attached with accountability and to a certain extent their safety standards. If the reputation and product or service matches or exceeds the expectations of the consumer, the ability to build trust and repeat patronage is greatly increased. 3. Community members wish to create a more meaningful consumer experience. Communities want to encourage creativity and entrepreneurship, supporting local efforts allows them to know the story behind what they buy, and thus building trust and a type of real relationship with whom they buy from and what they consume. This is a big factor in why local farmers’ markets and business owners bring meaning to the marketplace. As consumers, we learn their history and their struggle, we ask them important questions, we find out how our support can assist them in building their dream and help them grow. The local business relationship between owner and consumer becomes both meaningful and reciprocal, especially when they make an outstanding product and can gain that trust — it’s a win-win. An urban farm, slow-food enthusiast and mother of five, Jen Hill is a Utah transplant from Indiana. In her 2nd season of growing for a local CSA business, if she’s not instructing Pilates, or teaching at Highland High, you’ll most likely find Jen in the garden without shoes — her hands in the dirt! My interest in gardening goes beyond a hobby, my hands and farmer's tan can prove it, and intensely understand the challenges of growing food in a desert climate. I also understand it's a daily discipline and practice, and like anything you want to grow well, not something you can simply walk away from.